Data standardization is the critical process of bringing data into a common format that allows for collaborative research, large-scale analytics, and sharing of sophisticated tools and methodologies. Why is it so important? Healthcare data can vary greatly from one organization to the next. Data are collected for different purposes, such as provider reimbursement, clinical research, and direct patient care. These data may be stored in different formats using different database systems and information models. And despite the growing use of standard terminologies in healthcare, the same concept (e.g., blood glucose) may be represented in a variety of ways from one setting to the next. We at OHDSI are deeply involved in the evolution and adoption of a Common Data Model known as the OMOP Common Data Model. We provide resources to convert a wide variety of datasets into the CDM, as well as a plethora of tools to take advantage of your data once it is in CDM format. Most importantly, we have an active community that has done many data conversions (often called ETLs) with members who are eager to help you with your CDM conversion and maintenance. What is the OMOP Common Data Model (CDM)? 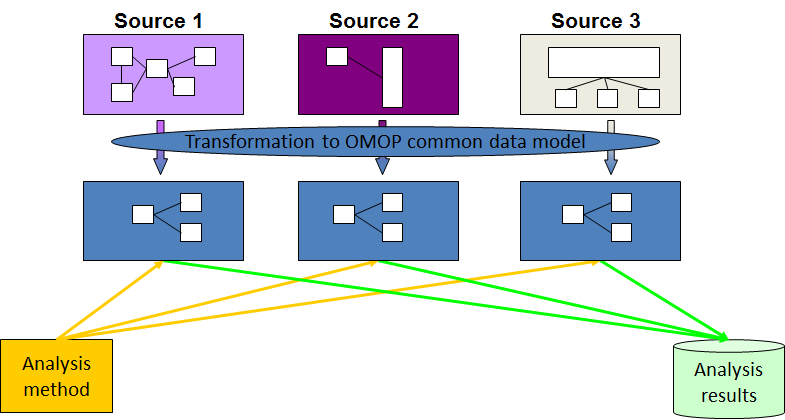 The OMOP Common Data Model allows for the systematic analysis of disparate observational databases. The concept behind this approach is to transform data contained within those databases into a common format (data model) as well as a common representation (terminologies, vocabularies, coding schemes), and then perform systematic analyses using a library of standard analytic routines that have been written based on the common format. Why do we need a CDM? Observational databases differ in both purpose and design. Electronic Medical Records (EMR) are aimed at supporting clinical practice at the point of care, while administrative claims data are built for the insurance reimbursement processes. Each has been collected for a different purpose, resulting in different logical organizations and physical formats, and the terminologies used to describe the medicinal products and clinical conditions vary from source to source. The CDM can accommodate both administrative claims and EHR, allowing users to generate evidence from a wide variety of sources. It would also support collaborative research across data sources both within and outside the United States, in addition to being manageable for data owners and useful for data users. Why use the OMOP CDM? The Observational Medical Outcomes Partnership (OMOP) CDM, now in its version 5.0.1, offers a solution unlike any other. OMOP found that disparate coding systems can be harmonized—with minimal information loss—to a standardized vocabulary. Once a database has been converted to the OMOP CDM, evidence can be generated using standardized analytics tools. We at OHDSI are currently developing Open Source tools for data quality and characterization, medical product safety surveillance, comparative effectiveness, quality of care, and patient-level predictive modeling, but there are also other sources of such tools, some of them commercial. For more information about the CDM please read the documentation, download the DDL for various database dialects and learn about the Standardized Vocabularies. If you have qustions post them at the OHDSI Forum. The Standard Vocabulary is a foundational tool initially developed by some of us at OMOP that enables transparent and consistent content across disparate observational databases, and serves to support the OHDSI research community in conducting efficient and reproducible observational research. And remember, the OHDSI community is here to help! Contact us at contact@ohdsi.org. Database bridging islands of information together with goal of supporting research into existing evidence about the association of drugs with health outcomes of interest. It includes but is not limited to evidence extracted from spontaneous adverse event reports, adverse events reported in drug product labeling, and adverse events reported in the indexed scientific literature. CEM is an improved replacement to the previously reported LAERTES system. One of the initial uses of CEM has been its use in generating lists of negative control concepts to be used in empirical calibration. To learn more about this process and how to use ATLAS to generate negative controls off CEM visit the wiki. Boyce RD, Ryan PB, Norén GN, Schuemie MJ, Reich C, Duke J, Tatonetti NP, Trifirò G, Harpaz R, Overhage JM, Hartzema AG, Khayter M, Voss EA, Lambert CG, Huser V, Dumontier M. Bridging islands of information to establish an integrated knowledge base of drugs and health outcomes of interest. Drug Saf. 2014 Aug;37(8):557-67. doi: 10.1007/s40264-014-0189-0. PubMed PMID: 24985530; PubMed Central PMCID: PMC4134480.